In a tragic twist of fate, a deadly boating accident during spring training led the Cardinals to acquire an outfielder who went on to produce one of the most remarkable single-game performances. On March 22, 1993, Indians pitcher Steve Olin was killed and pitchers Tim Crews and Bob Ojeda were injured severely in a boating accident on a Florida lake. Crews died the next day. Ojeda survived. Maxvill wanted an outfielder to back up projected starters Ray Lankford, Brian Jordan and Bernard Gilkey. Maxvill was about to make a deal for Braves outfielder Keith Mitchell, who was ticketed to open the 1993 season in the Atlanta farm system. Hart was offering to trade Cleveland’s starting right fielder, Mark Whiten, to the Cardinals if Maxvill would offer a pitcher Hart liked. Maxvill and Hart had discussed a possible deal during the winter meetings in December 1992. At that time, Hart asked about pitcher Mark Clark, who was 3-10 with a 4.45 ERA for the 1992 Cardinals. Remembering that exchange, Maxvill offered Clark to the Indians. Hart wanted a second player added to the deal. When Maxvill suggested minor-league infielder Juan Andujar, Hart accepted. Maxvill contacted the Braves and nixed the proposed trade for Mitchell. On March 31, seven days before the 1993 season opener, the Cardinals sent Clark and Andujar to Cleveland for Whiten. “It was a shock for me,” Whiten said of the trade. Whiten, 26, was joining his third major-league club. (He had played for the Blue Jays before joining the Indians.) He had a strong throwing arm, speed and power, but generally was considerd a raw talent. “I’m still learning,” Whiten conceded after the trade was made. Clark finished 7-5 with a 4.28 ERA for the 1993 Indians. In three seasons with Cleveland, Clark was 27-15. Andujar never reached the big leagues. In two seasons with St. Louis, Whiten had 39 home runs and 152 RBI. On April 9, 1995, the Cardinals traded Whiten and pitcher Rheal Cormier to the Red Sox for third baseman Scott Cooper and pitcher Cory Bailey. 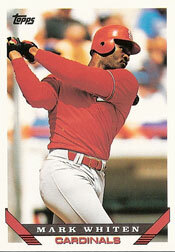 In retrospect, would the Cardinals have been better off with two extra years of Brian Jordan starting for them? On the other hand, excellent depth isn’t a bad thing. Good points. Thanks for reading and for commenting. I’ve joined your rss feed and stay up for in search of extra of your excellent post.